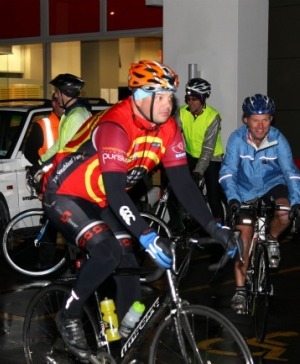 The Southland Times' sports editor Nathan Burdon lined up alongside the bunch of riders with varying levels of ability to make the 180km journey south. The trust provides the invaluable training and equipment to enable local chopper rescue crews to complete about 200 missions a year including many life saving flights. ''The rescue chopper has been at the front of my mind lately because I know a couple who had to use it recently. ''Without this vital emergency service what turned out to be a positive result probably wouldn't have been. '' he said. The team, which includes Westpac managers, rider and Tour de Lakes race director Allan Dunn, Invercargill broadcaster James McRobie and Cycling Southland chief executive Nick Jeffrey are expected to arrive in Invercargill in this afternoon.